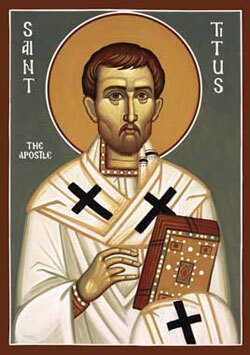 ST. TITUS was born a Gentile, and seems to have been converted by St. Paul, who calls him his son in Christ. His extraordinary virtue and merit gained him the particular esteem and affection of this apostle; for we find him employed as his secretary and interpreter; and he styles him his brother, and co-partner in his labours; commends exceedingly his solicitude and zeal for the salvation of his brethren. 1 and in the tenderest manner expresses the comfort and support he found in him, 2 in so much, that, on a certain occasion, he declared that he found no rest in his spirit, because at Troas he had not met Titus. 3 In the year 51, he accompanied him to the council that was held at Jerusalem, on the subject of the Mosaic rites. Though the apostle had consented to the circumcision of Timothy, in order to render his ministry acceptable among the Jews, he would not allow the same in Titus, apprehensive of giving thereby a sanction to the error of certain false brethren, who contended, that the ceremonial institutes of the Mosaic law were not abolished by the law of grace. Towards the close of the year 56, St. Paul sent Titus from Ephesus to Corinth, with full commission to remedy the several subjects of scandal, as also to allay the dissensions in that church. He was there received with great testimonies of respect and was perfectly satisfied with regard to the penance and submission of the offenders; but could not be prevailed upon to accept from them any present, not even so much as his own maintenance. His love for that church was very considerable, and at their request he interceded with St. Paul for the pardon of the incestuous man. He was sent the same year by the apostle a second time to Corinth, to prepare the alms that church designed for the poor Christians at Jerusalem. All these particulars we learn from St. Paul’s two epistles to the Corinthians. St. Paul, after his first imprisonment, returning from Rome into the east, made some stay in the island of Crete, to preach there the faith of Jesus Christ; but the necessities of other churches requiring his presence elsewhere, he ordained his beloved disciple Titus bishop of that island, and left him to finish the work he had successfully begun. “We may form a judgment,” says St. Chrysostom, 4 “from the importance of the charge, how great the esteem of St. Paul was for his disciple.” But finding the loss of such a companion too material, at his return into Europe the year after, the apostle ordered him to meet him at Nicopolis in Epirus, where he intended to pass the winter, and to set out for that place as soon as either Tychichus, or Arthemas, whom he had sent to supply his place during his absence, should arrive in Crete. St. Paul sent these instructions to Titus, in the canonical epistle addressed to him, when on his journey to Nicopolis, in autumn, in the year 64. He ordered him to establish priests, 5 that is, bishops, as St. Jerom, St. Chrysostom, and Theodoret expound it, in all the cities of the island. He sums up the principal qualities necessary for a bishop, and gives him particular advice touching his own conduct to his flock, exhorting him to hold to strictness of discipline, but seasoned with lenity. This epistle contains the rule of episcopal life, and as such, we may regard it as faithfully copied in the life of this disciple. In the year 65, we find him sent by St. Paul to preach in Dalmatia. 6 He again returned to Crete, and settled the faith in that, and the adjacent little island. All that can be affirmed further of him is, that he finished a laborious and holy life by a happy death in Crete, in a very advanced old age, some affirm in the ninety-fourth year of his age. The body of St. Titus was kept with great veneration in the cathedral of Gortyna, the ruins of which city, the ancient metropolis of the island, situated six miles from Mount Ida, are still very remarkable. This city being destroyed by the Saracens in 823, these relics could never since be discovered: only the head of our saint was conveyed safe to Venice, and is venerated in the Ducal basilic of St. Mark. (See Creta Sacra, Auctore Flaminio Cornelio, Senatore Veneto. Venetiis, anno 1755, de S. Tito, T. 1. p. 189. 195.) St. Titus has been looked upon in Crete as the first archbishop of Gortyna, which metropolitical see is fixed at Candia, since this new metropolis was built by the Saracens. The cathedral of the city of Candia, which now gives its name to the whole island, bears his name. The Turks leave this church in the hands of the Christians. The city of Candia was built in the ninth century, seventeen miles from the ancient Gortyn or Gortyna. Under the metropolitan of Candia, there are at present in this island eleven suffragan bishops of the Greek communion. = When St. Paul assumed Titus to the ministry, this disciple was already a saint, and the apostle found in him all the conditions which he charged him so severely to require in those whom he should honour with the pastoral charge. It is an illusion of false zeal, and a temptation of the enemy, for young novices to begin to teach before they have learned themselves how to practise. Young birds, which leave their nests before they are able to fly, are sure to perish. Trees which push forth their buds before the season, yield no fruit, the flowers being either nipped by the frost, or destroyed by the sun. So those who give themselves up to the exterior employments of the ministry, before they are thoroughly grounded in the spirit of the gospel, drain their tender interior virtue, and produce only unclean or tainted fruit. All who undertake the pastoral charge, besides a thorough acquaintance with the divine law, and the maxims and spirit of the gospel, and experience, discretion, and a knowledge of the heart of man, or his passions, must have seriously endeavoured to die to themselves by the habitual practice of self-denial, and a rooted humility; and must have been so well exercised in holy contemplation as to retain that habitual disposition of soul amidst exterior employments, and in them to be able still to say, I sleep, and my heart watches; 7 that is, I sleep to all earthly things, and am awake only to my heavenly friend and spouse, being absorbed in the thoughts and desires of the most ardent love.